I knit 30 hexipuffs in the month of May! I am sort of sad that I lost some quality knitting days during my travels at the end of the month, but seeing family was worth it. Overall, I’m pretty pleased with my progress and the pace. June is primarily going to be focused on the mini-skeins I received from Three Fates Yarns, so I hope to have a rainbow going on by the end of June. Off to to do some knitting! Let’s see, not a ton of yarny news to report this week! I am just so thrilled with my current minis stash and slowly working my way through each. 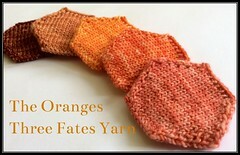 That said, the Three Fates Yarns collection is just gorgeous. I worked my way through the purple yarns this week. 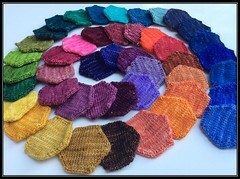 More detailed posts on each of these yarns is upcoming, but I finished all of the purples. In my zeal to play with and arrange the mini-skeins, I simply tore open the bundles of yarn instead of taking a close look at the name of yarn in the bundle. I had a bit of trouble identifying two of the colors, but I think my guesses are correct. Or rather they are going to be correct for my purposes. Here are the finished purple puffs. I’m trying to decide if I want to head into the reds or go backwards through the rainbow into the blues. A flipped coin may be in order. I will need to check into getting a natural colored yarn because I don’t have quite enough yarn left to finish a second hexipuff, but it is way too much to just toss into the scrap jar. I could always make striped puffs with two colors as well. 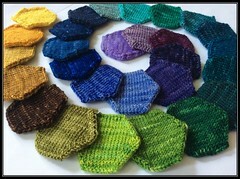 Or I could make stripped puffs with two colors and a natural yarn. Oooooo. Decisions, decisions. Speaking of decisions, I may have finally found my perfect project bag! Check this beauty out. I found it at the craft section of a local Greek festival I attended last weekend. As soon as I saw it, I knew I had to have it. It is a bowling back style opening, decent pockets inside, and I just love the floral design on the outside of it. I know I mentioned a new project last week using the gradient yarns, but I have had no time to really work on it so I want to make some decent progress on it before debuting it, so stay tuned! I am getting this post up later today because I was waiting to see if my package of yarny goodness from etsy seller Three Fates Yarn would switch from being “in transit” to “out for delivery.” What luck, it did this morning! I seriously cannot wait to wrap up the first little ball and get knitting! It would be prudent to finish the one currently on the needles, but it is just too tempted to start another, haha. 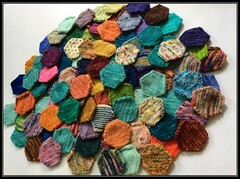 I have more yarn than I know what to do with now so it is time to get down to this hexipuff business for real! I don’t know that my original goal of buying me yarn every 25 puffs is going to be the most logical stash or budget wise, so I may need to rethink that part. I could just make it an even 50 until I get my stash worked down enough for it to make sense for me to buy more yarn. Now off to knit with me while Miss E naps for a bit! Next week I’ll tell you my plans for the remainder of the black trillium fibres Naiad gradient yarn I have left. The idea is still fully forming in my mind, but I should have it hashed out by then!